2009 was a great year for British literature, with Hilary Mantel's Wolf Hall and A.S.Byatt's The Children's Book duking it out for the Booker. The latter book was deeply concerned with how the sexual liberation of the Edwardian bohemians impacted their children. One of the key themes of the novel is to contrast the earnest liberal politics of the Bohemians with the lack of regard for their actual children. They want to make the world a better place, regardless of whether their children are fed and cared for, or hurt by their affairs. Byatt makes the point that artists and intellectuals can be both admirable for their work but a nightmare to live with. Strict principles can often be a convenient fig leaf for selfishness. Sally Potter's new film, GINGER & ROSA makes much the same point, drawing on a much smaller canvas, but with greater intensity. It's about how a father's radical conception of personal freedom damages his doting teenage daughter. Roland sees Ginger's tears but cannot stop the actions that cause the pain, equating personal sexual freedom, and setting aside bourgeois morality, with his opposition to armed conflict. It's a pompous but not indefensible position, but the the same could be said for so much that happens around the girl. Her gay godfathers genuinely care for her, but their tales of radicalism fuel her wallowing deaths possibility of a nuclear holocaust. Similarly, their friend Bella praises Ginger's activism but denies whipping her up. It's no wonder the poor girl is sad and confused, desperately trying to please and not complain. And what of Ginger's best friend Rosa? Although the focus of the film is not on her, she's an equally tragic figure. Where Ginger suffers from a surfeit of concerned but misguided adults, Rosa has a distracted mother and an absentee father. No wonder she latches onto Roland as an impressive father figure - a composite man to take care of her and shepherd her into adulthood. 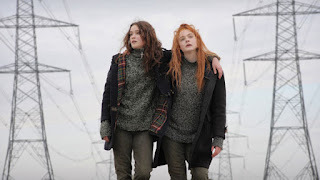 GINGER & ROSA seems to me to be a perfect film - tightly scripted, beautifully acted and photographed, evoking in minute detail the spirit and design of early 60s London, but also hinting at wider themes of revolt and parenting. I love that in place of the Swinging Sixties cliché we get a drab, grimy post-war world and an uneasy conflict between radicalism and 50s suburbia. Particular praise has to go to Elle Fanning (Ginger) who carries so much of the emotional burden of the film, but also Christine Hendricks in a smaller but equally intense role as her mother. Alessandro Nivola as Roland, her father, brings just the right balance of sleaze and headstrong idealism. But ultimately, the triumph of this picture is Sally Potter's, in bringing a new perspective to 60s London, and doing so with such formal control and intensity. If there is any justice, this film, and particularly Fanning and Hendricks' performances, will be recognised come awards season. GINGER & ROSA played Toronto and London 2012. It opens in the UK on October 19th. The running time is 89 minutes.